Oh, why hello there. My husband this morning said, “You look really pregnant in that dress,” and I could not disagree. I think my students might be figuring it out at this point, if one dude’s constant staring is any indication. The Babies are the Size of: Two pomegranates, according to my Ovia app. I should celebrate that milestone by splurging on a bottle of the overpriced-but-delicious Pom Wonderful. How I’m Doing: I’m doing well! I do continue to feel bigger and bigger everyday, which is a revelation that will shock exactly none of you. I’ve had a couple of mild instances of heartburn this week and some round ligament pain, but still I generally feel good. Movement: I continue to feel the babies move every now and then, but it is still subtle and inconsistent. Sometimes I sit still and concentrate on it, willing them to move, and then convince myself that I am imagining it. Other times, it feels quite certain that it’s a tiny baby (or two) persistently thumping me from the inside. I am looking forward to the times when the movement will be more consistent (and I can fret less about whether they are still alive in there) and when the movement will be perceptible from the outside, so my husband can join in the fun. Eating: I’m still not over my fruit cravings and am taking full advantage of the availability and cheapness of blueberries at this time of year. I’ve also been continuing to crave and thoroughly enjoy sweets. Chocolate chip cookies, Ben & Jerry’s “Americone Dream,” Twix bars, and all the fun Irish chocolate my husband brought me from his trip. #YOLO. 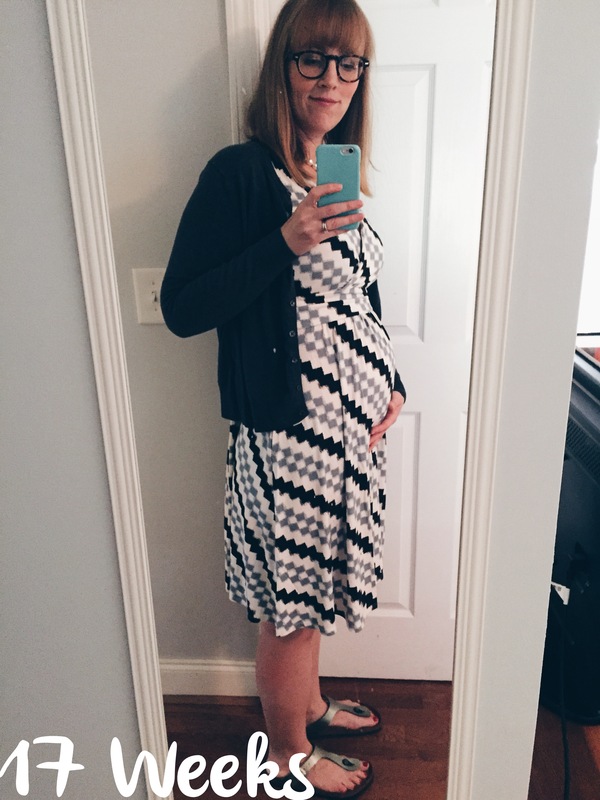 Wearing: The dress I have on in today’s photo is an Old Navy maternity number, and I love how easy and comfortable it feels. I’m about to convince myself to go buy more in other colors. I’ve also had to buy some new workout clothing recently — I realized that while most pairs of my stretchy compression crops still technically fit over my body, the waistlines were getting too tight and were squeezing my uterus in a really uncomfortable way. I ordered some full-panel crops, also from ON. I will report back on those after I receive them, if anyone cares. Ultrasound: Don’t get excited because I can’t tell you the sexes yet. I had this whole post typed up and ready to go for after we told our families, but CW decided he doesn’t want to tell anyone yet– until this weekend. So I’m sorry to say there is no news here today. Womp, womp. That said, we did have a successful anatomy scan and everything looks perfect! Baby B was not in a good position to see the heart valves today, though, so we will try to look at those in two weeks. All the other anatomy looks great and is developing and measuring just as it should be. Of course, THIS is what matters most. Once Mr. Privacy is ready to share, I’ll fill y’all in on the good details.